Innovation, skilled workforce, superior business strategy, a strong customer service, are just some of the aspects that distinguishes a multinational from a local company. Some of the companies – whether they are in the manufacturing, food processing, real estate, automobile or any other segment – have achieved a cult status because of its products that are a class apart. Many of these companies have seized the opportunities provided by increasing liberalization and globalization and have set up their bases in other countries. They have been able to capture the global market on the back of an upgraded technology and proficiency in local business sector. Along with technological competencies, these companies have also harnessed the natural resources and workforce of the respective nations. This has enabled the corporations to set up their manufacturing plants on foreign shores where labor is cheap thus producing their products at a much lesser cost as compared to what they would be spending in their own country. The increasing globalization has resulted in intense competition among the corporates with each aiming to capture a significant part of the local market place. The companies have adopted various strategies to capture the attention of the customer and gain their loyalty. Companies such as Walmart, Apple, Samsung, Toyota, Rolex, and many others have made a mark around the world due to their superior technology, business strategies, customer service, and marketing plans. Many of these companies are known for their innovations which has given them an edge over other organizations thus straightening their foothold around the globe. 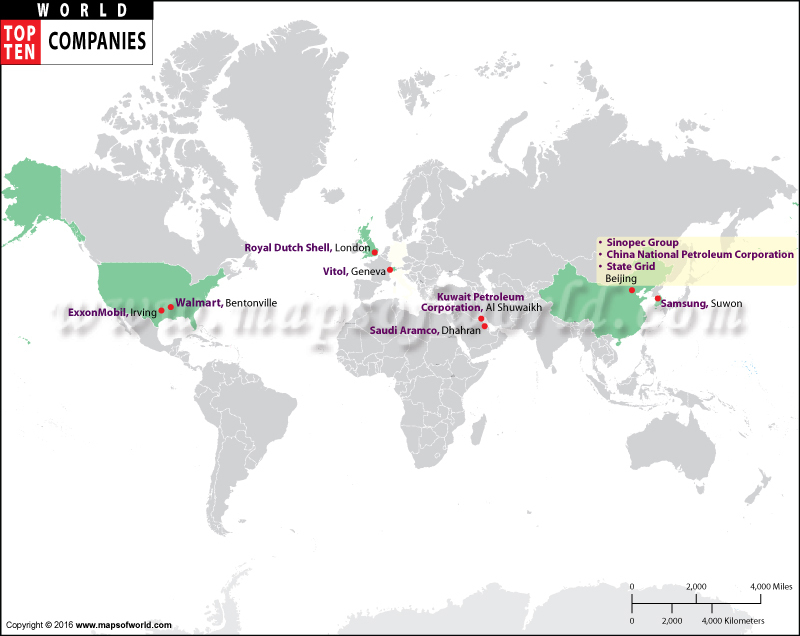 Here we provide a map of some of the top companies around the world. You can also browse the list below the map which would give you a better understanding about the company’s headquarters, industry in which it operates and revenues.